"Now everyone comes to me to borrow money, the same ones who used to criticize me". In a slum outside the grand old city of Lahore, a woman named Saima Muhammad used to dissolve into tears every evening. 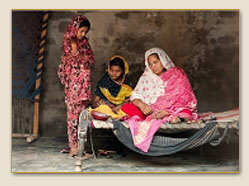 Saima had barely a rupee, and her deadbeat husband was unemployed and frustrated and angry. He coped by beating Saima each afternoon. Their house was falling apart, and Saima had to send her young daughter to live with an aunt, because there wasn’t enough food to go around. 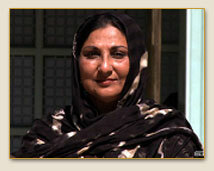 “I had an awful life,” recalls Saima. UN WOMEN'S AGENCY: GUYS, WHAT TOOK YOU SO LONG? Pakistan - In a slum outside the grand old city of Lahore, a woman named Saima Muhammad used to dissolve into tears every evening. Saima had barely a rupee, and her deadbeat husband was unemployed and frustrated and angry. He coped by beating Saima each afternoon. It was at that point that Saima signed up with the Kashf Foundation, a Pakistani microfinance organization that lends tiny amounts of money to poor women to start businesses. Saima took out a $65 loan and used the money to buy beads and cloth, which she transformed into beautiful embroidery that she then sold to merchants in the markets of Lahore. She used the profit to buy more beads and cloth, and soon she had an embroidery business and was earning a solid income - the only one in her household to do so. When merchants requested more embroidery than Saima could produce, she paid neighbors to assist her. Eventually 30 families were working for her, and she put her husband to work as well - “under my direction,” she explained with a twinkle in her eye. Saima became the tycoon of the neighborhood, and she was able to pay off her husband’s entire debt, keep her daughters in school, renovate the house, connect running water and buy a television. "These women are empowered and it's great to see." They have no uniform and little training but a small band of Afghan women are taking the battle to the Taliban after becoming Helmand’s first female police recruits, the Ministry of Defence said yesterday. The 13 Afghan National Police women were taken under the wing of British MoD police officer Isabella McManus after she found them sitting unnoticed in a corner at Police Headquarters. Tales of heroic feats already abound - one woman was honoured with a police award after reportedly karate-kicking a detonator from the hands of a would-be bomber. Many of the women do not tell their neighbours or even their families what they do for a living for fear of reprisals. Zaazanga, who is 36 and married with six children, said: "I tell my neighbours that I work at a clinic. My job is a secret from everyone, not even my husband knows." "Robina understood the cultural nuances ... the religious issues." Toward the end of her marriage, Rabia Iqbal said she feared for her life. She claims her husband turned violent, and when she finally left him, she did not know where to turn. She was hiding out in her office at work when a friend put her in touch with Robina Niaz, whose organization, ‘Turning Point for Women and Families,’ helps female Muslim abuse victims. "Now I feel empowered as if I have my own identity other than a wife and mother." A battered housewife, a Muslim widow and an illiterate mother of four are among a group of Indian women – some from the poorest quarters of the Indian capital -looking to carve out a living by breaking into the male preserve of New Delhi taxi drivers. The project is the brainchild of Meenu Vadera of the Azad Foundation, a voluntary group that works with disadvantaged women whose employment prospects - if they exist at all - are usually limited to the world of domestic help. Rita, 24, who recently signed up for the programme, ran away from her marriage and home after suffering seven years of abuse at the hands of her parents-in-law. Living at the home of a friend in Delhi, Rita saw the female taxi project as a way out of a social and economic dead end. "It is absolutely vital in this world and it should have happened sooner." After years of foot-dragging, the U.N. General Assembly has finally approved a resolution to create a high-level agency for women’s rights, which supporters have hailed as a historic breakthrough. The decision this week to merge four U.N. bodies dealing with women’s issues to form a single agency with greater clout comes after three years of political wrangling - and decades after the world body created similar agencies to deal with children, refugees, environment and development. “This is really an opportunity to address some of that by consolidating all those existing entities into a proper fully fledged agency that would have resources, authority and a mandate to really start improving women’s lives on a significant scale,” Kathy Peach, policy and advocacy manager at the Voluntary Service Overseas (VSO), said. "Unicef is working round-the-clock to bring back smiles on the faces of thousands of children." Tuba Sahaab, an Islamabad-based schoolgirl, who wrote anti-Taliban poems criticising their radical views on girls and women’s education in Pakistan, may have been an impetus behind the recent project planned by the local government and the Unicef to rebuild girls’ schools in troubled regions. The ‘Welcome to School’ initiative, that will benefit 532,000 children through the 18-month plan in Pakistan, has been formulated to encourage girls like Tuba who will be able to attend lectures without living in fear of being bombed by Taliban militants. The aim is to provide temporary learning spaces and education supplies. Apart from that, community-based back-to-school campaigns will be carried out, aimed at getting all previously enrolled children back into school, as well as enrolling children who have never been enrolled - especially girls. "The program offers Muslim women of today a real opportunity to develop themselves and influence the workforce of the future." 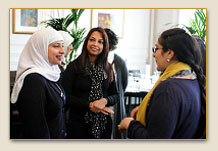 The UK’s first regional network leadership program exclusively for Muslim women was launched in Leeds on September 4. ‘Get Connected,’ introduced by the BME Voluntary and Community Sector Panel Ltd, will cover the Yorkshire and the Humber area and is expected to raise representation of Muslim women.